​﻿Tensile test gives valuable information about finite element analysis and some criterion on its evaluation. It should be noted that tensile test can be not only used for acquisition of flow stress but it can be also useful for evaluating accuracy of finite element simulation of metal forming processes because it is mechanically very simple, i.e., its boundary conditions are clear. Many researchers have thus studied material identification, based on the tensile test of cylindrical specimens [1-6]. However, very few researchers have simulated the tensile test with higher accuracy . Joun et al. developed an iterative approach for acquiring flow stress of material at the room temperature using tensile test of cylindrical specimens and its finite element prediction by rigid-plastic finite element method. This approach has a merit that flow stress at large strain can be obtained and it can be used to predict tensile test with higher accuracy by rigid-plastic finite element method. However, due to the limitation of the theory of rigid-plasticity, the approach may be exposed to some errors at the elastic region. Rigid-plastic finite element method inherently approximates a plastic deformation of material in the elastic region and thus its accuracy depends more or less on the process. Elastoplastic finite element solutions are also dependent on the specific theory and numerical schemes. 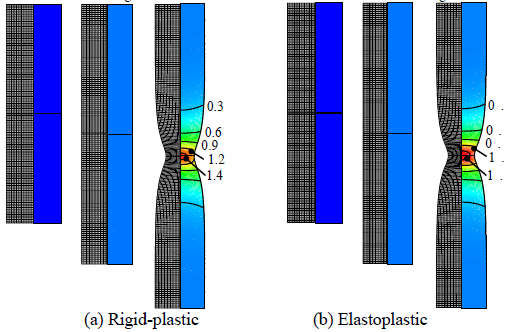 Both rigid-plastic and elastoplastic finite element methods have their own strengths and drawbacks and thus it is meaningful to reveal the similarity and difference between the two approaches in a quantitative manner. However, it is not easy to find the related research work. In this series of posts, a tensile test of SCM435 is simulated by both rigid-plastic and elastoplastic finite element methods and their predictions are compared to clarify the difference and similarity. In the simulation, the same flow stress which was obtained by the iterative approach to identifying material property using tensile test of cylindrical specimen . A coil material of SCM435, spheroidized with annealing, is used for this study. Initial yield strength of the material obtained by tensile test shown in Figure 1 is 385 MPa. The tensile test was studied by both a rigid-plastic finite element method [8,9] and an elastoplastic finite element method . In the rigid-plastic finite element method, a traditional isoparametric quadrilateral linear element with reduced integration scheme was employed. The same mesh system was employed for the elastoplastic finite element method together with B-bar element technique  considering numerical locking phenomena occurring in simulating incompressible material and computational efficiency. The material was assumed isotropic and to obey Huber-von Mises yield criterion. 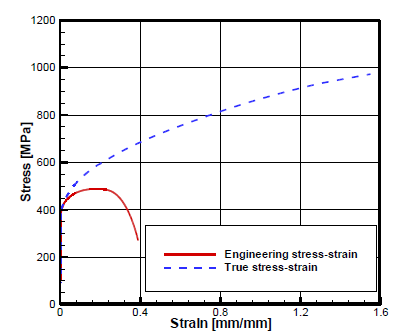 Figure 2 shows engineering stress-strain curve and its corresponding true stress-strain curve or flow stress curve. This flow stress curve was obtained from a tensile test depicted in Figure 1using an iterative method which employs large strain at the necked region before fracture . Note that the characteristics of the curve lie in flow stress at large strain, for example, more than 1.5. It is usual that engineering strain at the necking point is less than 0.2 in tensile test of cylindrical specimen. However, it should be noted that the true strain just before fracture may reach over 1.5 and this fact can give flow stress at the large strain. 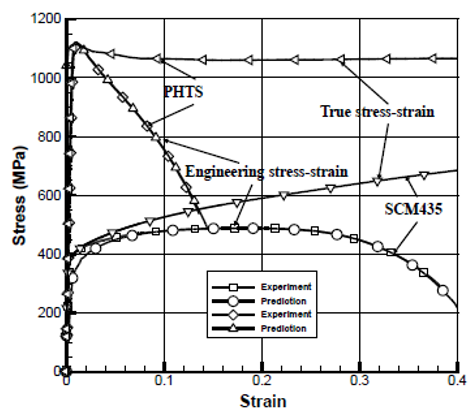 It is also noteworthy that, as shown in Figure 1, the flow stress employed to obtain the predictions of the tensile test which are identical with the experiments in the engineering sense. using the flow stress in Figure 1 and rigid-plastic finite element method. This simulation was accomplished by 1000 solution steps which are sufficiently small enough to neglect the numerical effect. In the next week’s post, the elastoplastic predictions will be discussed in detail and the comparison would be made. J. G. Eom, Y. H. Son, S. W. Jeong, S. T. Ahn, S. M. Jang, D. J. Yoon, M. S. Joun:Effect of strain hardening capability on plastic deformation behaviors of material during metal forming, Material and Design 54(2014)1010-1018.